Return on invested capital (ROIC) is not only the most intuitive measure of corporate performance, but it is also the best. It measures how much profit a company generates for every dollar invested in the company. 3-year average return on invested capital (seen in Figure 1) provides additional insights into a firm’s track record of prudent capital management. Companies with a high 3-year average ROIC consistently allocate capital to high return investments. Properly calculating ROIC, the primary driver of stock prices, is key to measuring a firm’s ability to generate returns on the capital invested in its business. Our Robo-Analyst technology allows us to perform the diligence needed to calculate an accurate ROIC and comparable metrics, such as , 3-year average ROIC, ROGIC and GAAP-based ROIC. We make it easy for clients to leverage the benefits of a high quality ROIC model and see a clear picture of a firm’s true profitability. Figure 2 shows the Russell 1000 companies with the highest and lowest 3-year average ROICs. 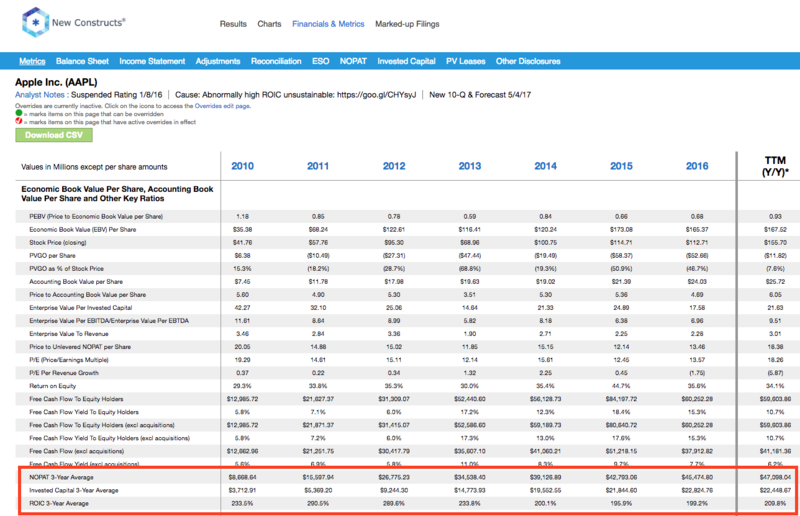 Apple’s 210% 3-year average ROIC is the highest of all Russell 1000 companies under coverage. See Apple’s 3-year average ROIC each year dating back to 2010 here. Mastercard (MA), United Therapeutics (UTHR), Gilead Sciences (GILD), and Manhattan Associates (MANH) earn the second through fifth highest 3-year average ROIC. However, a high 3-year average ROIC alone doesn’t mean a company earns an Attractive-or-better rating. Apple and Mastercard both earn a Neutral rating. See Mastercard’s 3-year average ROIC each year dating back to 2010 here. 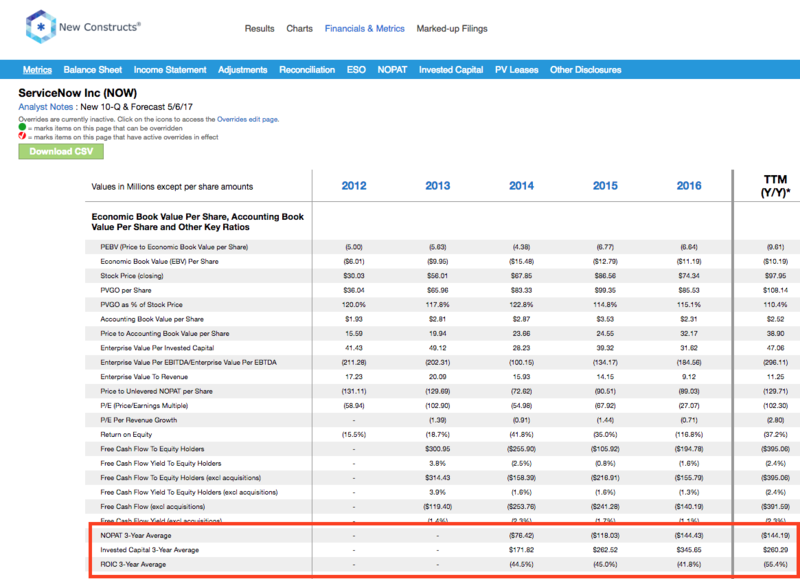 Nutanix Inc. (NTNX) earns the lowest 3-year average ROIC of all Russell 1000 companies under coverage. NTNX has earned a negative ROIC each year since going public in 2015. ServiceNow (NOW), ACADIA Pharmaceuticals (ACAD), Intercept Pharmaceuticals (ICPT), and Splunk Inc. (SPLK) round out the five lowest 3-year average ROIC’s across the Russell 1000. 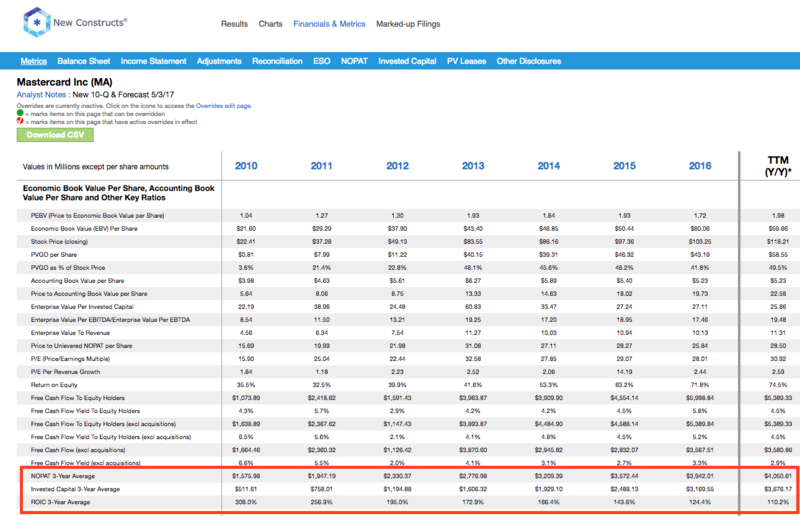 ServiceNow, a previous Danger Zone pick, has failed to earn a positive ROIC or 3-year average ROIC in any year since going public in 2012. 3-year average ROIC has actually declined from -45% in 2014 to -55% over the last twelve months. ServiceNow’s strategy of revenue growth at all costs has been a clear destruction of shareholder value. See NOW’s 3-year average ROIC since 2014 here. Our models and calculations are 100% transparent because we want our clients to know how much work we do to ensure we give them the best earnings quality and valuation models in the business. Providing multiple versions of a given metric is part of this transparency. We customize calculations and metrics for clients as they see fit. We are not in the business of selling any one particular methodology. Our focus is on providing clients with a higher quality data set with which to perform calculations with integrity across thousands of stocks, ETFs, and mutual funds.